Spondylosis is a term used to describe degenerative changes of the spine or osteoarthritis 'wear and tear'. Exiting the intervertebral foramen are the nerve roots. Therefore narrowing around the intervertebral foramen because of degenerative changes may cause compression of the nerve root. 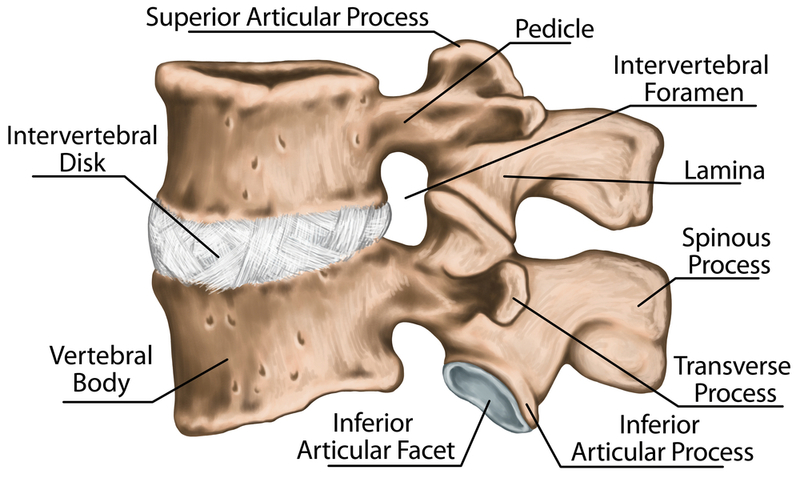 Bulges from the intervertebral disc or osteophytes from a degenerative facet joint can all reduce the space of the intervertebral foramen and cause radicular nerve root pain. Degenerative changes occur over time. There can be lots of different causes. Previous injury, altered biomechanics, poor posture, abnormal loading/pressure can all cause degeneration. The good news is you can do something about it and take measures to prevent it! Prevention is better than the cure, so taking care of your spine is key to living a pain free, healthy life! However it is not too late to start looking after your spine if you have already developed degenerative changes. The spondylosis won't go away but your pain and symptoms can. What can I do to treat spondylosis? There are lots of things we would suggest to help ease the symptoms you are experiencing. Pain relief medication. There is debate about the use of pain relieving medication and whether it actually does anything. I have met lots of people that take it either just because their doctor prescribed it or just because it makes them feel as though they are doing something to help. I am not a big lover of pain medication as I feel there are so many natural ways and longer term solutions to managing pain. For some people it works and others not so much. I usually let my patients make the decision but to also encourage people try other avenues such as exercise. Anti-inflammatory medication can be very useful for someone who is experiencing inflammatory pain, just to break that cycle of pain. Exercise. My favourite treatment choice! Degenerative changes will result in reduced range of movement and stiffness. This can lead to further pain. Therefore the correct spine stretches that wont aggravate the pain can be extremely successful at improving range of movement and reducing pain. Strengthening the spine and postural muscles will help support the area, reduce pain and improve function. Clinical Pilates covers both bases! I have designed workouts specifically for spondylosis! Try a workout for free today! Acupuncture can also aid in pain relief but my advice would be to start exercising for long term relief and benefit! Try my Physio led clinical Pilates workouts to build strength and flexibility back to your spine!